42 albums and mixtapes, forty .. two! FACE OFF IS A SOUTHERN CLASSIC! That's all I have to say about that, it's not really here for debate to be quite honest because it's my blog lol. But seriously though, that album is severely underrated in terms of the music at the time because that was the same year that I'm Serious, Mista Don't Play, Both Worlds *69, Dirty Money, Word of Mouf, Choices: The Album, then you had Big Boi & Dre Present... Outkast making noise, in addition to all of those albums you had Nas dropping the classic Stillmatic which everyone was listening to because of Ether. There were a slew of other albums that came out that year too that a lot of people were listening to that were decent to good, but Face Off was important because it kept the lyrical content going that were use to and it still had those trap beats that we all love. 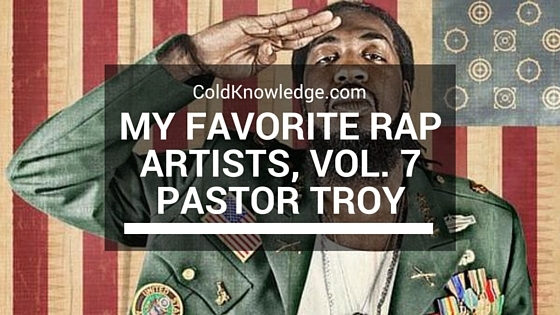 Plus that album had a number of songs that are still being bumped today; This tha City, Move To Mars, Can You Stand The Game, Vica Versa, No Mo Play In G.A., Rhonda, Eternal Yard Dash & Oh Father are all songs that when people name when asked do they listen to Pastor Troy. Eight out of fourteen tracks that are considered southern classics just from other people hearing the songs from other people, if that's not a classic album, I don't know what is. My very first piece of music that I owned was We Ready (I Declare War) on tape, (that let's you know how old I am). So for that simple reason Pastor will always have a place in my music collection. I've spent a lot of time looking for certain albums and I'm convinced that I have to go to ATL just to find it. But all in all Pastor is one of my favorites to this day and I still play his music religiously with people always asking who I'm listening to when I'm playing his new stuff. Outside of Face Off, Tool Muziq & Face Off, Part II are two of my favorite of all time. From here til the end of time I will forever play Pastor Troy, long after he has come and gone because he's one of my southern heroes. 2000 | I Am D.S.G.B.